We are republishing here, with the kind permission of Oliver Baentsch of Germany, a fascinating analytical piece he has written for his blog ‘Flicking Forever’ (www.flickingforever.net). All content remains as it was published by Oliver. While watching several Subbuteo Table Football games on YouTube, I got to know the shooting habits of some of the top players. But I wanted to go deeper and started a Subbuteo shot analysis of at least 500 shots. Here’s what I found out. Even for Subbuteo beginners, the basic strategy is obvious: Attack an opponent through the wings or try to draw his or her defending line out of position by hovering around the middle. A lot of players do so because the wings are invitingly open unless the defending figures are shifted there quickly. So for my Subbuteo shot analysis, I assumed that the majority of all shots (misses and goals) would eventually come from a diagonal angle to the goal. 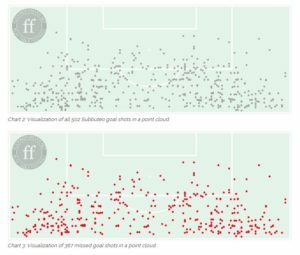 With descriptive statistical methods, I wanted to find out which spots on the pitch are the most promising for shooting many goals. Let’s make one thing clear: This is NOT a representative study. All I had in mind was to record and evaluate at least 500 shots from various Table Football matches. So I randomly chose 27 fulltime games that I found on YouTube (all links at the end of this post) and listed any shot from these games in an Excel sheet. I differentiated between goals and misses and wrote down the players’ names, too. I finally produced a sheet with 502 shots and their exact positions (x- and y-coordinats) on the pitch, 135 shots led to goals, so the shooting percentage (Pct) was 0.27. Even table-loving nerds will cry for visualization at this point. Okay, here we go: The first chart gives an overview of all recorded Subbuteo shots. The red dots show the positions of missed shots, the green ones show the goals achieved. There’s the well expected accumulation of shots from the left and right wing. The reason is obvious as mentioned before: Facing strong defensive lines, top players will have to shift their attacking figures to the far right or left to enter the shooting area. The chart above represents all the goal shots that had not been successful. You will clearly see shots close to the shooting line tend to be less successful over all. 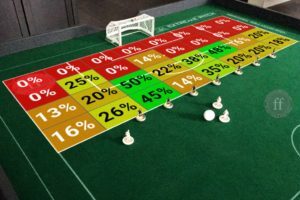 I recorded 135 goals during my analysis of Subbuteo Table Football games, the chart above shows all the shooting positions on the pitch. Interesting is the split up to the left and right wing as well as the accumulation of successful shots from close to the penalty area. 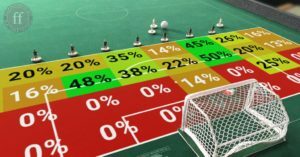 But entering the penalty area reduces your chance of shooting a goal significantly: Not one goal had been made from closer than the penalty spot. After publishing the first version of this article, FISTF president Steve Dettre asked me if there was a difference between players shooting left handed or right handed. Fortunately, I had captured these informations as well. Here are two charts that visualize all shots from left-handers and right-handers. Chart 5 shows all shots (misses=red, goals=green) from left-handers. You can see clearly that more shots and goals are achieved from the left wing. Shots from the right wing tend be less dangerous over all. Chart 6 shows all shots (misses=red, goals=green) from right-handers. These players are very successful from the right wing or whenever they shot from close to the penalty box. In a next step, I tried to aggregate these dotted charts. 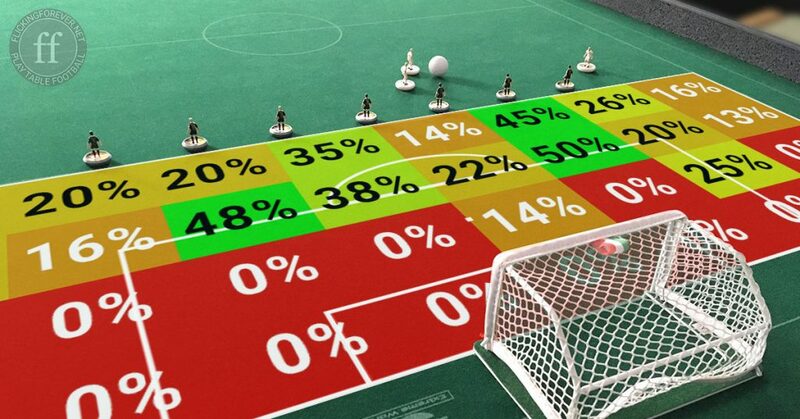 A heatmap seemed to be the perfect visual method for the Subbuteo shot analysis so I devided the shooting area into 8 x 4 equal sectors and calculated shooting percentages (Pct) for each sector. The heatmap shows shooting percentages (Pct) in 32 sectors of the shooting area. 50% means that every second shot from this sector had led to a goal. Sectors A1 to A8 show a 0% chance of scoring a goal from there (might be possible in Association Soccer with a fancy curve ball, but in Subbuteo? Forget it!). Most sectors in the second row – B1 to B8 – are unlikely areas for many goals and often get the 0% label as well. In the rows C and D we finally identify the best sectors to shoot a goal. Watch out for C3 (50%), C6 (48%) and D3 (45%) with a really promising Pct. In these sectors, I counted 41 goal (from 91 shots). In an upcoming blog post, I will try to work out some tactics and exercises to reach these sectors more often with your attackers. But for now we will have a detailed look at some of the featured top players.